YouTube reviewer, "Tool Box Buzz" names the DeWalt DXFR300 Rechargeable 2-way radio "a must" for job sites. SNELLVILE, GA; NOVEMBER 30th, 2018– YouTube reviewer, "Tool Box Buzz" names the DeWalt DXFR300 Rechargeable 2-way radio "a must" for job sites. The heavy-duty walkie-talkie was taken on a 70,000 square foot commercial job site for experimentation, and it passed with flying colors. 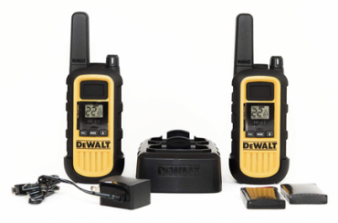 According to Rob Robillard, founder of "Tool Box Buzz," they tested the walkie for ease of use, range, audio quality, ergonomics, functionality, runtime and sufficient volume. "We used the radios for two weeks and were surprised at how well they worked.All of the team agreed that the audio quality is very good to excellent," says Robillard. In Robillard's YouTube video, subscribed to by over 77,000 followers, he showcased the DeWalt, offering insider feedback for business owner would. "The radios have a 22-channel range; the channels are preset with privacy codes to minimize unwanted interference from others. We did not experience interference in our testing. I can see these radios having a permanent home with our team, as well as useful in all types of business and tasks. Well done, Dewalt." · UHF/FM: Ultra-clear long-distance reception (range varies on terrain). · Roger Beep Tone: Confirmation tone indicates the completion of the user's transmission, and signals others it is clear to talk. · Key Lock: When activated, provides keypad security eliminating accidental channel changes. · Power Saver: A unique circuit extends the life of your batteries. If there are no transmissions within 10 seconds, the unit automatically switches to battery save mode. · Auto Squelch: Automatically shuts off weak transmissions or unwanted noise due to terrain constraints. · LCD Display: Easy to view display provides the radio's status at a glance. · Speaker/Microphone/Jack: Allows use of wall charger or earphone speaker/microphones (not included) for 'hands-free' operation. · Runtime hours based on (90% Standby / 5% Talk / 5% Listen).